One of the most prevalent issues facing utility pole owners is aging pole transfers, but they don’t have to be a constant struggle. Timely pole transfers rely on clear communications and good relationships between the pole owner and the attachers. A failure in the chain of communication results in lagging transfers, backlogs and increased liability. There are abundant opportunities for a breakdown in the transfer process: is the pole owner’s asset data accurate? Did the owner send the transfer request? Did the attacher receive it? Is the attacher dealing with a backlog of transfer requests? Has the transfer been completed, but the attacher hasn’t notified the pole owner? Was the pole owner notified, but didn’t update the completed transfer in the database? This can be challenging when managing many different attachers and multiple pole transfers, with diverse state and local requirements. Double poles are a problem we have discussed before, but to recap this is a situation in which two (or three) utility poles end up standing where there should only be one. This is problematic for a couple of reasons. First, if a pole was slated for removal because it was damaged or rotten, then leaving it standing is a danger and a liability. 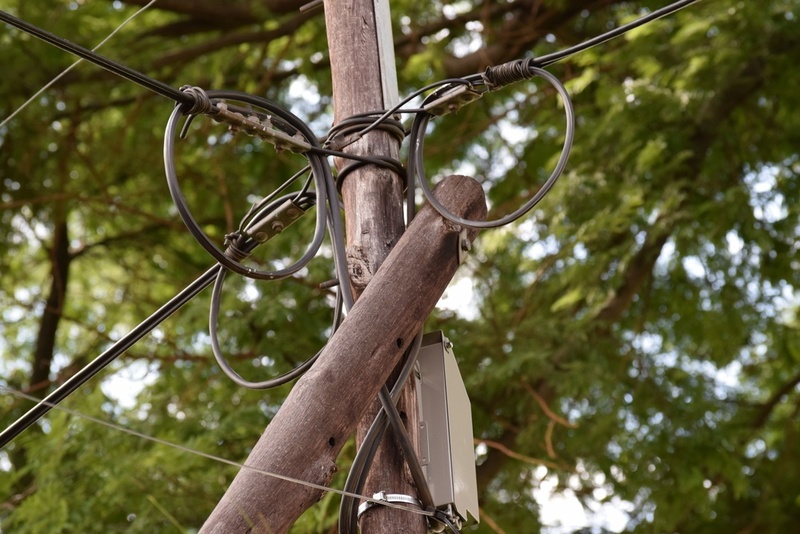 If a damaged or rotten pole were to fall and cause damage, the asset owner would likely be responsible. In addition, local governments and the public often see double wood as an eyesore, as well as a hazard for pedestrians. The bottom line: no one likes them. Everyone involved wants attachments transferred from the old pole to the new one, and the old pole to be removed as quickly as possible. Confirm the Attachment Data: A record of who is attached to what pole and whether or not a transfer has been made, should be easily obtainable and accurate. If the asset owner has kept joint use records organized and up-to-date, this will be the case. However, if the data on file is not current, then the first step should be to identify who to contact about equipment relocation. Conduct a Site Visit: If records on the pole or transfer are not current, or are suspected of being incorrect, owners should perform an in-person site visit to determine the next steps. Pole owners have a few options when it comes to this-- either send someone from their in-house staff to visually survey the pole or hire a third-party to perform the work. Either way, findings must be recorded accurately and kept in a centralized, shared database, preferably in a robust joint use management system that makes retrieving the information easy for everyone. Prior to completing a pole transfer, someone must designate the type to determine the skillset needed to perform the work. Is it simple, complex, idle, or has it actually already been completed? Read about the various types of poles transfers here to learn more. Get the Work Done: It is time to remove the doubled pole when: a detailed assessment has been made, the type of transfer has been determined, attachers have been contacted and successfully removed equipment and all data has been updated and recorded. Remedying double poles—or ensuring they do not happen in the first place—is a matter of having the field team to do the surveying, communicating, and removing. Many pole owners may need to hire additional staff to keep up with transfers or contract a third-party to clear the backlog and stay ahead of new requests. In addition, a joint use management software solution can make good pole stewardship more efficient and cost-effective.